If you grew up watching My Little Pony or Teenage Mutant Ninja Turtles, Hey Arnold, and Full House, then you definitely grew up in the 90's. This era of brightly colored clothes, cartoons of all kinds, and wild & wacky kids; its no wonder the candy matches this description. 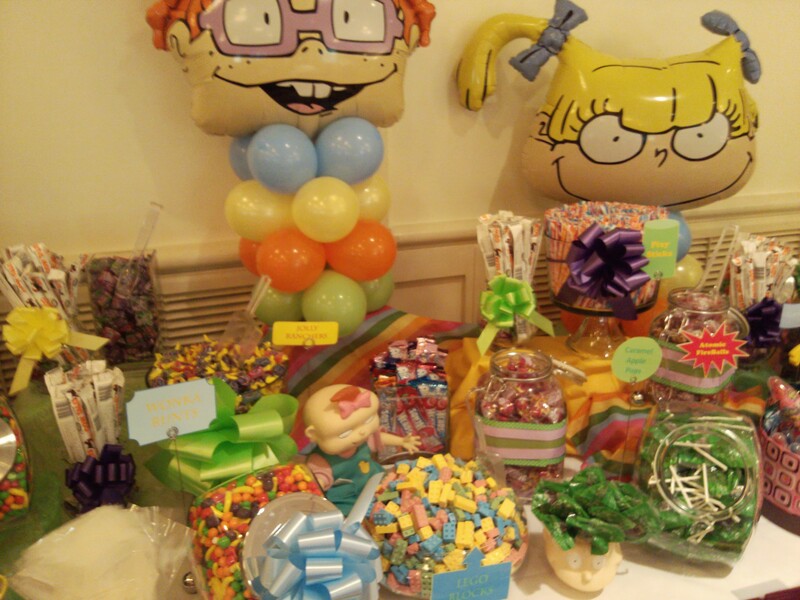 When I was asked to put together a 90's themed candy buffet for a "Saved By The Bell" event I was totally excited!! My search for nineties candy had me reminiscing about all the goodies that I used to enjoy. When I had completed my list I had over fifty candy items on it. This was a large list, that I would have to dwindle down for it to be a reasonable candy buffet. The client and I are old acquaintances and had lots of fun deciding what to keep for the event. Our final list was still very impressive and filled with a wide variety of candy options for all the nineties babies. 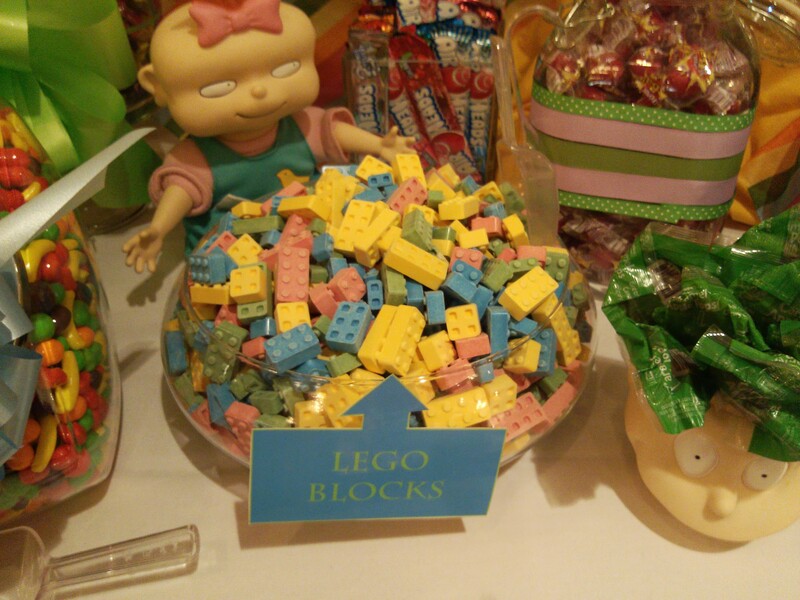 We decided to go with the iconic Baby Bottle Pops, Caramel Apple Pops, Pixy Sticks (got to love that sugar punch), Wonka Runts, Lemon Heads, Atomic Fireballs, Airheads, Cowtales, and Lego Blocks (which are sweettarts that you can actually build objects with like real legos). With the candy picked out, next I had to pick how I was going to decorate the table. Since we also specialize in balloon decor, I decided to start off with looking at our balloon collections and seeing what I could pull that would go with the nineties themed. I found many balloons that were from my childhood, but the balloons that stuck out to me the most were the Rugrat Head balloons. I thought "why not put these on top of mini, colorful balloon towers"? And it worked. It was all air-filled too so didn't take any helium. They turned out super cute and I now had three centerpieces to decorate my table as well as some old Rugrat items that we had in storage. This was just meant to be! It was so lucky to come across the Tommy and Angelic cups and the Rugrat Dolls too! All this added to my balloon columns on the table would be all that I would have room for. When it came time to set all the items out and decide how to place it all, it took a lot of work. There was so much candy that I had a hard time finding large enough containers. And when I finally did get it all in containers, I ran out of room on the table. So I had to rework it a couple of times until I got it just right. At the actual event, our table was even smaller then we had originally thought, so Angie and I had to do some creative thinking. The final table looked great! 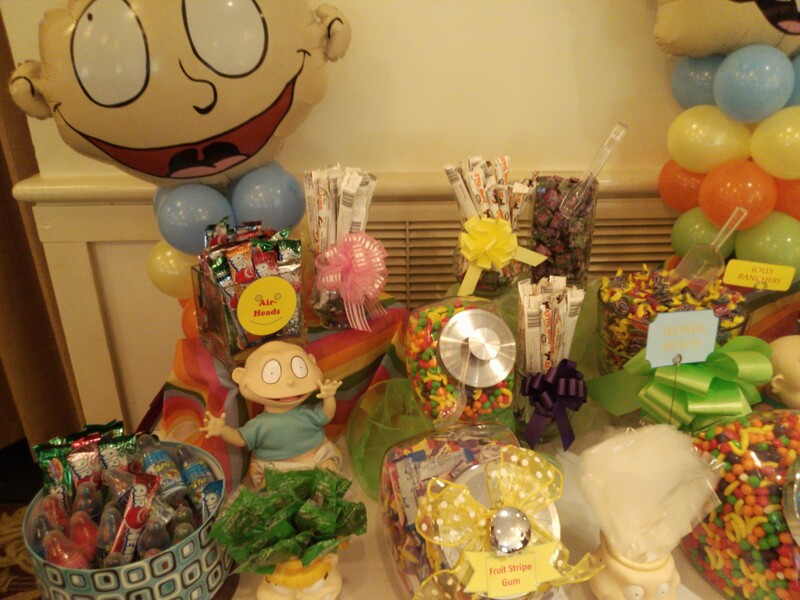 And had the candy all spread out so that a little bit of everything was on each part of the table. As you can see, this was one candy buffet that was not playing around. It had a little bit of everything and was perfect for the wild and wacky guests. When I went with my little brother do to the clean-up, we got to see all the attendees dressed up in their nineties clothes. It was a lot of fun to see them enjoying the candy. 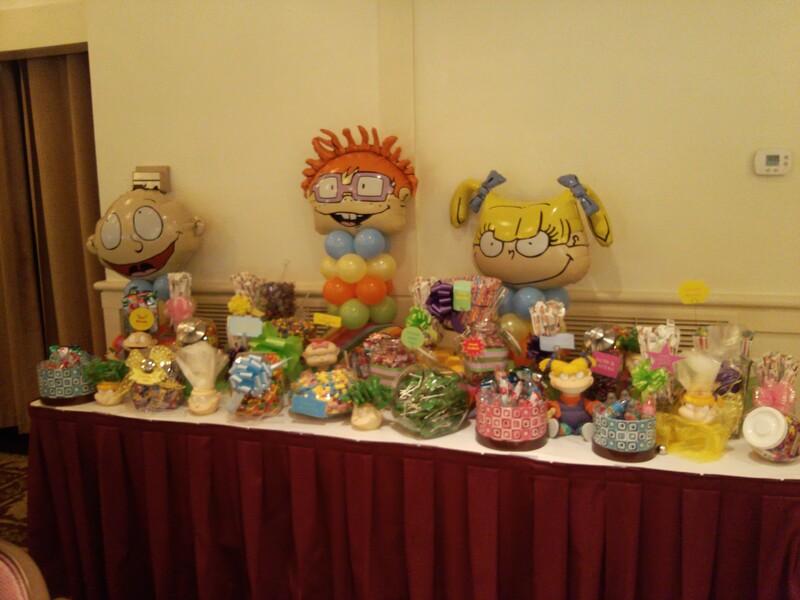 Everyone was so impressed with it all; display, centerpieces, and candy spread. We even caught someone trying to take the Angelica centerpiece. Doing a decade themed candy buffet reminded me of last summer when I put together a buffet of 100 year old candy. That was a lot of fun, just like this. So followers, challenge me with your next party's candy buffet and let me create a masterpiece! And remember "Stressed spelled backwards is desserts, so enjoy".